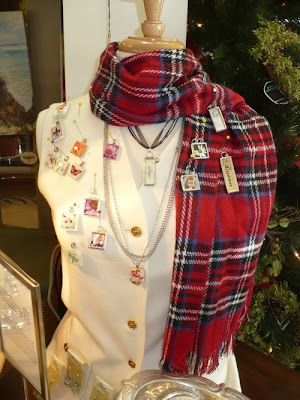 No, we aren't selling clothes, but we are selling jewelry. Our "model" is decked out in her winter finest (actually her only winter outfit). If you look closely, you'll see the glass and soldered pendants we have in the shop. All are handmade in the USA, along with the other jewelry shown below on the mirror. 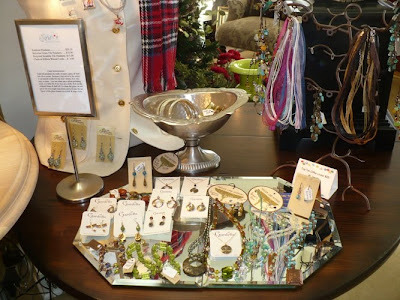 We received a new shipment of Vintage Earth and Gardella jewelry just a few days ago. These unique bracelets, earrings and necklaces will look great with casual wear and as well as your newest holiday sweater! Doesn't jewelry qualify as "Holiday Decorating"? We think so. If you still need something special for your dining room table checkout these beautiful red glass candle holders. They could be setting with your greenery, or they looking great by themselves. Or these square glass candle holders---they would be great for a less formal area. Maybe a coffee table or the mantle in the family room. 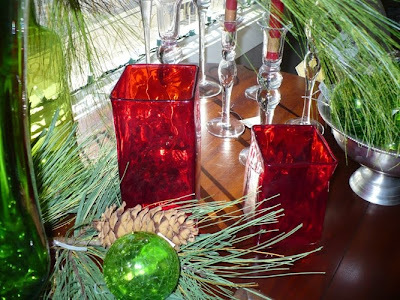 The Trapp candles will fit down inside of the squares (we tried it)! 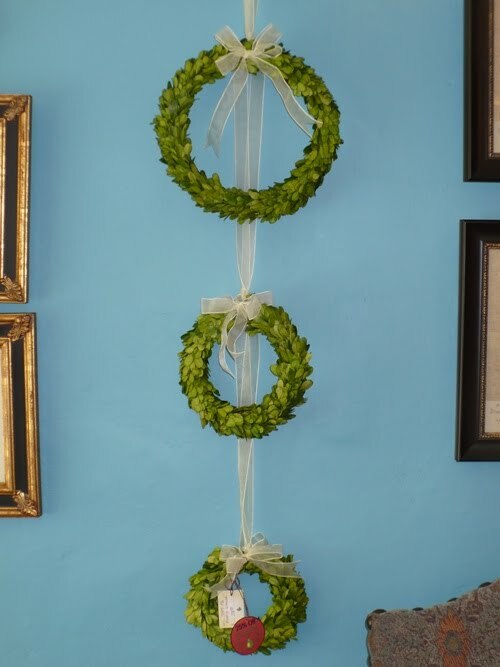 If your walls are still bare, try a simple boxwood wreath. These are actual preserved boxwood greens, and they need a spritz of water about once a week. We have just a few of the three sizes left. You can hang them together or each one by itself. 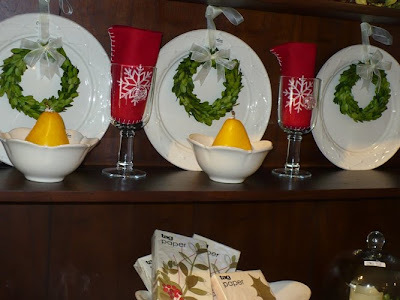 We really liked the Casafina white plates as a background for the smallest wreaths. 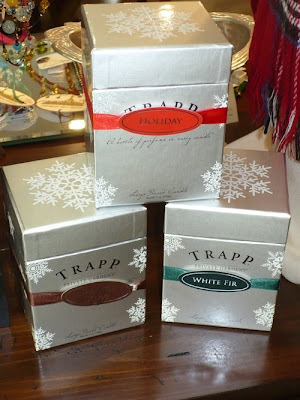 And we can't sing enough praises of Trapp's Christmas scents! We just received another 4 cases, but they won't last long, either. If you smell something wonderful when you open the front door---you're smelling a Trapp candle! 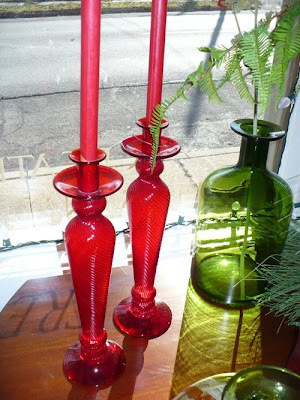 Here's another set of candles holders. Sometimes "three" just works better than "two" when it comes to decorating. 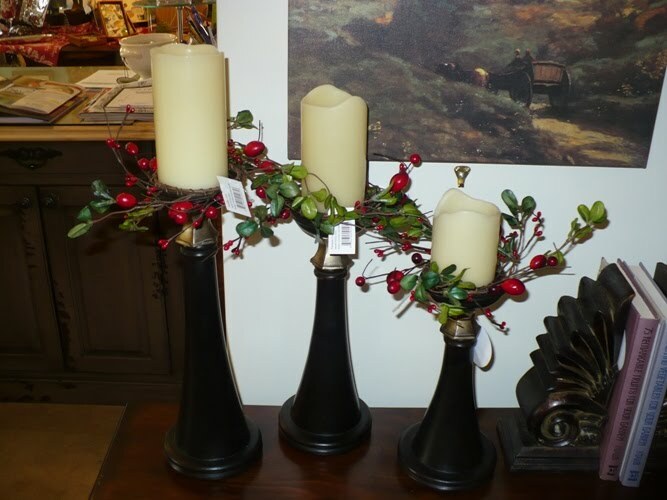 This set of candle holders is perfect for using year 'round. Just change the little candle ring, or don't use one at all. They're even better if you use our battery operated candles. We'll help you find just the right thing to finish off your Holiday decorating. Just don't wait 'til the last minute---you should be enjoying it NOW!